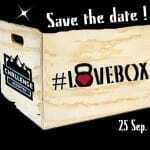 LoveBox – Challenge accepted ! #LoveBox – Challenge Accepted ! Share your passion with us at CrossFit ! Limited places. Registration from August 2 . Find a friend , a lover or convince your sibling to participate.